When the fibularis tertius is weak, what kinds of performance and health issues can you get? Let’s look at Fibularis Tertius (FT) anatomy, actions, measurement methods along with the implications weak FT strength can have on your athletic performance and health. Note: The Fibularis Tertius is the muscle in red in the drawing and is also known as the Peroneus Tertius muscle. The fibularis tertius terminology has an advantage when learning anatomy in that it indicates the muscle is on the fibula side of the lower leg. The FT is located on the lateral side (outer side or side with the fibula) in the anterior (front) compartment of the lower leg and is superficial (towards the skin). The top of the muscle attaches to the lower 1/3 of the fibula and the deep connective tissue between the tibia & fibula known as the interosseous membrane. The muscle runs down the antero-lateral side of the calf, connects to its’ tendon which runs just in front of the lateral ankle. The tendon then attaches to the base of the 5th metatarsal. The main action of this muscle is to dorsiflex your foot (pull the foot up) and at the same time, evert it (twist towards the outside). This can be summarized as, “pointing your foot up and out”. Weakness in the FT can be determined with manual muscle strength testing, careful observation of ankle alignment during walking, running and at rest and other tests. Supporting information can be gained through a detailed history as well as physical examination for neurological, vascular and orthopedic signs. Measurement of FT ranges of motion and muscle strength are available with specialized equipment such as tensiometers or isokinetic testing devices when required for more detailed examinations, insurance purposes or research. When the FT muscle is weak, you will not have the strength you should in the following situations. 1) Dorsiflexing (pulling it up) & 2) Everting the foot (twisting the sole towards the outside). 1) Dorsiflexing the foot – The FT is involved in dorsiflexing the foot (lifting the foot up). Since there are a few other muscles that contribute to this motion, it will be rare to experience the most severe form of this condition commonly called ‘foot drop’ unless these other muscles are weak as well. What is more likely to be experienced by the person with only FT weakness is poor control of the ankle when doing dorsiflexion which require strength or speed. Soccer athletes will have difficulty kicking a ball accurately or powerfully forward and to the outside. Skiers, skaters and dancers will have ankle control issues and stability will be impaired in the forward to backward plane or on the diagonal. When FT weakness is more pronounced, the foot will tend to drop slightly and invert (sole twist to the inside) when lifting the foot up. This can result in more frequent tripping by catching the small toes on the swing through phase of walking or running. 3) Eversion of the foot – The FT also everts the foot (twists the sole towards the outside). Having adequate strength in the FT is thus critical in any activity that requires maintaining lateral ankle stability. 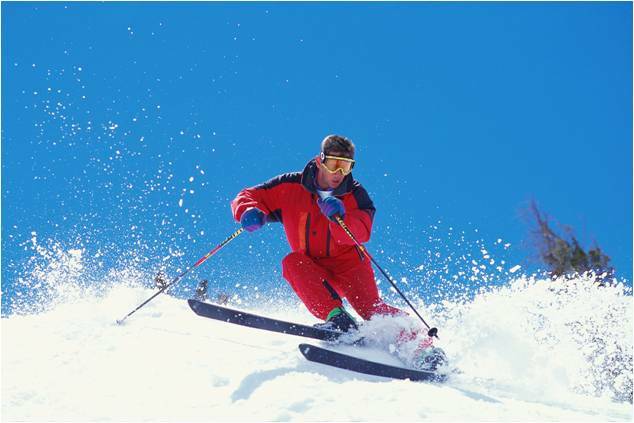 For example, running over rough terrain, sticking a landing in gymnastics or ‘holding an edge’ when snow skiing. One legged stance balance and strength will be impaired for dancers and this will be a critical factors for seniors who are looking to prevent traumatic falls. 1) Lateral ankle protection – The lateral ankle is particularly susceptible to sprains as the ligaments supporting that side are much weaker than on the medial ankle. 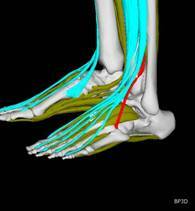 Roughly 80-85% of all ankle sprains happen on the lateral side. Considering that the number of ankle sprains in the US are between 1 & 10 million per year, this is a very substantial number. The relatively small FT is the only muscle that supports the lateral ankle when the foot is dorsiflexed (foot pulled up). 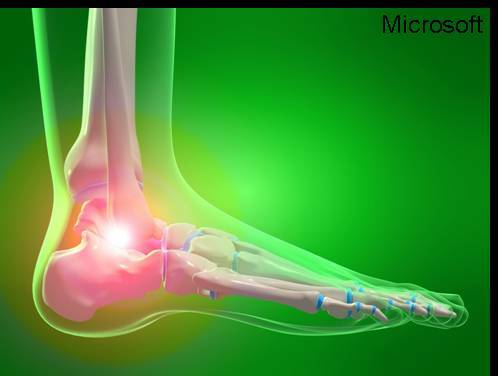 People with a weakness of the FT will be much more likely to experience a lateral ankle sprain as they do not have the strength to recover rapidly enough after experiencing an ankle deviation which threatens the ligaments. When a sprain occurs, at least one of the fibularis muscles which protect the lateral ankle are typically damaged (i.e. fibularis: longus, brevis or tertius). Rather frequently, therapy is only oriented to recovery of the ligament. The joint is immobilized or supported with athletic tape, rigid or semi-rigid device until the ligaments can take weight bearing without difficulty. Whichever of the fibularis muscles receives damage will also require rehabilitating with specific exercises to prevent a chronic weakness of the FT and increased susceptibility to recurring ankle sprains, instability and performance degradation. 2) Shin splints & anterior compartment syndrome – Shin splints are a fairly vague term used to describe pain in the anterior portion of the lower leg. This will result when any of the muscles in that region receive damage otherwise known as a muscle strain. The FT is one of the muscles in this region that can frequently be involved due to it’s relatively small size. Direct action damage – to the FT can come about through vigorous kicks to the outside or forcible plantar flexion (pointing the foot down) particularly when simultaneously twisting the foot to the inside (see arrow). Overexertion of the FT can also result from trapeze artists attempting to hang from their feet without adequate exercise preparation. Indirect action damage – to the FT is also commonly experienced though it’s involvement in ‘breaking’ or deceleration of the foot at the end of vigorous toe off maneuvers (jumping) The FT will be most susceptible during jumps which also involve lateral movement to the same side (i.e. jumps up and to the right will more likely require right FT braking). With people who do not have a FT of comparable strength to their toeing off jumping muscles, they can literally rip their own FT when they attempt to put the ‘brakes’ on their foot motion at the end of a jump. The muscular strain damage and resulting pain or ‘shin splints’ can last for days to months depending on the severity. Anterior Compartment Syndrome – Muscles in the anterior (front) of the lower leg are also susceptible to a particularly nasty complication from muscle strains. This region has a relatively tough membrane encasing the muscles that does not expand readily when there is swelling. This results in the thinner walled veins and lymph vessels that are contained within the muscles encased by this membrane to collapse as the swelling pressure increases from a strain. The thicker walled arteries however, continue to deliver blood. This results in further increase in pressure in the anterior compartment. This vicious cycle can continue until there is a severe increase in pressure which can compromise all circulation and threaten oxygen starvation and tissue death. 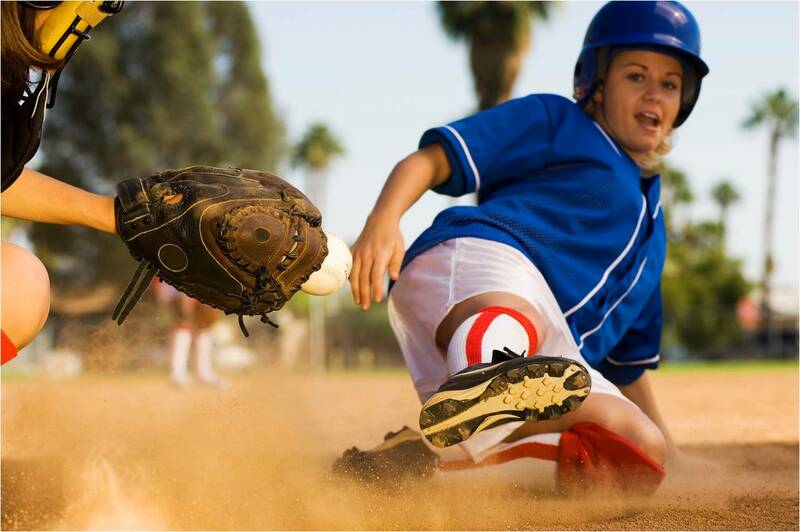 This complication is known as ‘anterior compartment syndrome’ and can progress to the point of a medical emergency. Learn how to test for muscle strength imbalances with education & certification courses offered by the Diagnosis Foundation. Then you can help identify muscle weakness early, when correction takes the minimal effort.